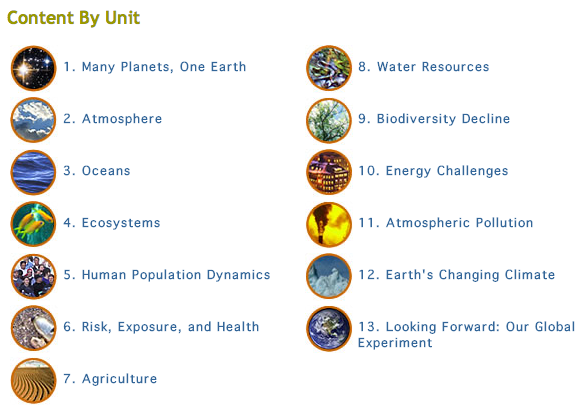 I just stumbled upon this course at Learner.org, called “The Habitable Planet: A Systems Approach to Environmental Science.” I haven’t had the time yet to fully explore it, but it looks to be a tremendous resource for our class. I recommend you bookmark this page in your browser and come back to it whenever we start a new topic (or when you’re revising for mock exams, topic tests, and/or the IB Exam. I will definitely be consulting it for some activities in future lessons. Here’s a screenshot of the major topics you’ll find. This entry was posted in Environmental Systems and tagged biodiversity, climate change, environmental science, ESS, pollution, systems. Bookmark the permalink.